The Pirates announced today that they’ve selected the contract of right-handed reliever Richard Rodriguez and recalled fellow righty Kyle Crick. Both players were pitching for the team’s Triple-A affiliate in Indianapolis. To make room on the big league roster, right-hander Clay Holmes and left-hander Josh Smoker were optioned to Triple-A. Pittsburgh’s 40-man roster was at a count of 38 players prior to Rodriguez’s selection, so there’ll be no 40-man move necessary to accommodate him, and the team can even make another addition without needing to open further space. The 28-year-old Rodriguez, a longtime Astros farmhand, broke into the Majors with the Orioles in 2017 but tallied just 4 2/3 frames with Baltimore at the big league level. Rodriguez, though, has carved up Triple-A hitters dating back to 2015, working to a 2.54 ERA with a 221-to-65 K/BB ratio in in 219 2/3 innings. His strikeout rate has steadily risen on a year-over-year basis, topping out at 10.2 K/9 in 2017, and he’s already whiffed nine in five shutout innings this season. Last year with the O’s, Rodriguez’s fastball sat at 93.8 mph in his brief big league audition. As for Crick, he was one of two pieces acquired in the trade that sent franchise icon Andrew McCutchen from the Pirates to the Giants. The former supplemental first-rounder and top prospect shifted to the bullpen with quite a bit of success in 2017, punching out 12 hitters per nine innings with a 2.76 ERA in Triple-A. That prompted a big league call-up for Crick in San Francisco, where he’d go on to log a 3.06 ERA in 32 1/3 innings — albeit with much more pedestrian marks of 7.8 K/9 against 4.8 BB/9. Crick averaged 95.5 mph on his heater, though, and was superb at limiting hard contact in his time with the Giants (20.5 percent). The Pirates undoubtedly hope that he can be a viable bullpen weapon in Pittsburgh, as the hard-throwing 25-year-old can be controlled through the 2023 season. 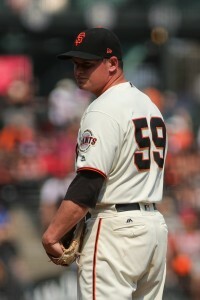 He’d allowed one run with five strikeouts and no walks through four innings of relief thus far in Triple-A this year. While Billy Hamilton’s name has been oft-mentioned in trade rumblings this offseason, a deal involving the Reds’ fleet-footed center fielder may not be all that likely, writes Zach Buchanan of the Cincinnati Enquirer. San Francisco’s acquisition of Andrew McCutchen doesn’t have much of an impact on the Giants’ chances of swinging a deal for Hamilton as they look to add a strong defender with their (limited) remaining financial resources. But, Buchanan reports after speaking with multiple sources, a deal was looking “unlikely” anyhow. Talks between the Giants and Reds regarding Hamilton have gone “dormant,” per Buchanan, adding that one source expects Hamilton to be in Cincinnati come Opening Day. Cardinals chairman Bill DeWitt Jr. wouldn’t comment on the chances of his team signing Greg Holland, writes Ben Frederickson of the St. Louis Post-Dispatch, but DeWitt generally expressed some trepidation about the notion of spending heavily (in either dollars or prospects) to acquire a “proven” closer. “[C]losers are not guarantees,” DeWitt said. “…It’s a hard job. You go over the history of closers, and it’s not particularly guaranteed that you’re going to get longevity, which you think you’ll get out of a starting pitcher.” DeWitt did acknowledge that he’d “rather give up dollars than players” in a general sense, but DeWitt’s full comments certainly don’t convey the sense that adding a high-profile arm for the ninth-inning is a top priority. Frederickson also writes that outfielder Randal Grichuk is “not thrilled” about the notion of being a reserve option in 2018, though that’ll be the case barring an injury to one of Marcell Ozuna, Tommy Pham or Dexter Fowler. Grichuk didn’t complain about his role so much as voice a desire to prove that he can still be a significant asset and factor prominently into the Cardinals’ success. “I hope they feel confident in themselves, and you don’t want anyone doubting themselves, but hopefully they know I’m there,” said the outfielder. “And if I get an opportunity, I’m going to try to make the best of it and not look back.” Frederickson’s column features quotes from roughly a half-dozen Cardinals players as well as manager Mike Matheny and DeWitt. Rob Biertempfel of the Pittsburgh Tribune-Review runs down some potential candidates for the Pirates’ outfield — both external and internal — in the wake of the Andrew McCutchen trade. Pittsburgh will likely be on the lookout for a right fielder, with Starling Marte headed to center field and Gregory Polanco shifting to left. Austin Meadows, according to Biertempfel, will head to Triple-A to open the year regardless of how well he plays in Spring Training. (One club source indicated to Biertempfel that Meadows could “hit .900 in Spring Training” and still be ticketed for the minors.) That’s not especially surprising when considering that Meadows posted an ugly .250/.311/.359 slash in his first exposure to Triple-A last year. ESPN’s Keith Law offers his opinion (subscription required and recommended) on the Pirates’ trade for McCutchen, whom he calls a “great” pickup for the Giants, given the putrid output they received from their outfield in 2017 and the low bar that McCutchen has to clear. While neither Kyle Crick nor outfield prospect Bryan Reynolds is an elite young talent, Law opines, Crick offers a potential long-term option in the bullpen and is the type of arm that can “sometimes turn to gold via the alchemy of baseball” despite his history of below-average command (a trait that he did improve in 2017). He calls Reynolds “very interesting,” adding that he considered Reynolds’ to be San Francisco’s second-best prospect at the time of the trade. 5:34pm: Ken Rosenthal of The Athletic tweets that the Pirates are covering $2.5MM of McCutchen’s $14.75MM salary. 5:25pm: It became all the more clear on Monday that Pirates fans are looking at the end of an era, as the team announced that face of the franchise Andrew McCutchen has been traded to the Giants (along with cash considerations) in exchange for young right-hander Kyle Crick, outfield prospect Bryan Reynolds and $500K worth of international bonus pool space. Outfield help has been a priority for the Giants all offseason after last year’s collective unit combined to bat .253/.311/.374 in more than 2000 plate appearances. Inserting McCutchen into that mix should provide a significant boost on the offensive side of the equation, as the 31-year-old turned in a very strong rebound campaign at the plate in 2017, hitting .279/.363/.486 with 28 homers (his highest total since hitting 31 back in 2012). Of course, questions about McCutchen’s glovework persisted in 2017 — and it should be noted that the Giants’ outfield defense was the worst in baseball last year. San Francisco outfielders combined to post an MLB-worst -45 mark in Defensive Runs Saved, and they ranked just 28th with a -11.4 Ultimate Zone Rating. The since-traded Denard Span played no small role in those shortcomings, but McCutchen’s marks of -14 and -4.5 in those respective stats don’t exactly stand out as an indicator that an extensive amount of help is on the defensive horizon. If the Giants were to play McCutchen in an outfield corner, perhaps he could post more meaningful contributions in that regard. At present, he figures to line up in center field, though the Giants could yet play McCutchen in left field and acquire a cost-effective center field option with a stronger defensive reputation (someone in the mold of Jarrod Dyson, speaking from a speculative standpoint). However, it’s important to note that there may not be room for the Giants to make much of an addition. San Francisco will add more than $9MM to its luxury tax ledger by picking up the final year of McCutchen’s deal, which should place them roughly $7MM from the threshold. San Francisco has reportedly been aiming to remain under the tax cap in order to reset its penalty level. For the Giants, McCutchen is the second notable veteran bat the team has landed via trade this offseason. San Francisco also picked up Evan Longoria in a trade that sent Christian Arroyo, Span (plus the remaining year of his contract) and a pair of minor league pitchers to the Rays. Depending on their willingness to either shed additional payroll or pivot and exceed the luxury tax for a fifth consecutive season, those two big-name acquisitions could prove to be the Giants’ primary offseason acquisitions. The McCutchen agreement comes just days after the Pirates shipped right-hander Gerrit Cole to the reigning World Champion Astros, further signaling a transitional period in Pittsburgh, though the pair of trades does not necessarily indicate that a full-scale tear-down is on the horizon for the Bucs. Both Cole (controlled through 2019) and McCutchen (a free agent next winter) were short-term and relatively high-priced assets — especially for a Pirates team that operates on a notoriously thin budget. McCutchen is slated to earn $14.75MM in the final season of his contract, whereas Cole had settled at $6.75MM in order to avoid arbitration. The Pirates, then, will be saving a combined $21.5MM with this pair of swaps — money that could, in theory, be reinvested into the 2018 roster. The Pirates have, after all, opened each of the past three season with payrolls in excess of $90MM but now project for a payroll of roughly $82MM in 2018. The Bucs could further reduce that 2018 commitment if the team ultimately finds a trade partner for infielder/outfielder Josh Harrison; the versatile veteran is slated to earn $10MM this season and, like Cole and McCutchen before him, has been an oft-mentioned trade candidate this offseason. The 25-year-old Crick was the 49th overall pick in the 2011 draft and ranked among baseball’s top 100 prospects from 2013-15, per various reports. While his rise through the minors was slowed by control issues, he had a strong year in 2017 after converting to the bullpen on a full-time basis. In 29 1/3 innings of relief in Triple-A, he posted a 2.76 ERA with 12.0 K/9, 4.0 BB/9 and a 44.3 percent ground-ball rate. That strong run led to Crick’s big league debut with the Giants; in 32 1/3 innings in the Majors, he logged a 3.06 ERA with 7.8 K/9, 4.7 BB/9 and a 37.9 percent ground-ball rate. Crick’s 95.5 mph average fastball velocity and 11 percent swinging-strike rate both pointed to the potential for his big league strikeout rate to catch up to the more impressive level he flashed in Triple-A. Crick is controllable through the 2023 season, so he’ll join a lengthy list of controllable assets the Bucs received in the Cole trade as a potential long-term piece that can step directly onto the roster. Reynolds, 23 later this month, was the Giants’ second-round pick in 2016 and just wrapped up a strong season in Class-A Advanced, where he hit .312/.364/.462 with 10 homers, 26 doubles and nine triples in 540 trips to the plate. Jim Callis and Jonathan Mayo of MLB.com had him fourth among Giants prospects, while Baseball America ranked him fifth among San Francisco farmhands just a few weeks ago (before the Arroyo trade, meaning he’d now rank fourth on their list as well). As for the Pirates’ immediate future in the outfield, it’s not yet entirely clear how they’ll fill the void. Starling Marte seems likely to slide over from the corner outfield to center field, which should be a defensive upgrade over the life of a full season. Top prospect Austin Meadows showed in 2017 that he’s likely not yet ready for the Majors — Meadows hit just .250/.311/.359 in Triple-A — so the Bucs could turn to a platoon of 26-year-old Adam Frazier and veteran utility man Sean Rodriguez in left field for the time being. Alternatively, Pittsburgh could wait out the free agent market and see if any veterans become available on bargain deals. 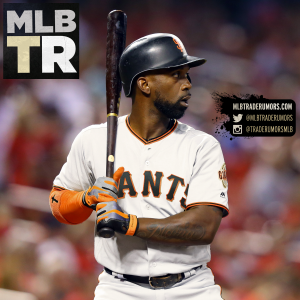 The corner outfield market has no shortage of experienced options (MLBTR Free Agent Tracker link), and some of those names will undoubtedly have to settle for one-year deals later this winter. Robert Murray and Jon Heyman of FanRag Sports first reported that talks between the two sides were picking up (Twitter link). Ken Rosenthal of The Athletic reported that the two sides had reached an agreement (Twitter link). Alex Pavlovic of NBC Sports Bay Area tweeted that Crick was in the deal. Yahoo’s Jeff Passan tweeted that Reynolds was likely to be a part of the deal, and The Athletic’s Andrew Baggarly confirmed as much. MLB.com’s Jon Morosi reported that the Pirates would pay some of McCutchen’s salary. Dodgers general manager Farhan Zaidi tells J.P. Hoornstra of the Southern California News Group that Gabe Kapler’s departure to become the Phillies’ new manager now leaves the Dodgers with the onerous task of finding a new person to fill the “toughest job in baseball.” Kapler spent three years as the Dodgers’ director of player development/farm director, and Hoornstra notes that the new ideas he brought to the table have helped the lay the foundation for the team’s current run of success. “You’ve got to be able to relate to a lot of different factions and constituents between the front office, the major league club, major league manager, coaches, players throughout the system, affiliates, minor league players, minor league coaches,” said Zaidi of the unique challenges the role presents. Per Zaidi, the team will be casting a “wide-open net,” and the search could take a few weeks. Hoornstra points out that Jeremy Zoll, Kapler’s top assistant who could have been a leading internal candidate, has already been scooped up by the Twins to serve as their farm director in 2018 and beyond. Newly minted Padres hitting coach Matt Stairs plans to bring an emphasis of on-base percentage and selectivity to the lineup, writes MLB.com’s AJ Cassavell. Cassavell notes that Stairs’ famous one-liner, “Swing like you live: hard,” leads to some misconceptions about his philosophy; Stairs doesn’t necessarily preach swinging often but believes in being aggressive when deciding to do so. “I’ve always been a guy that always preaches — even when I wasn’t coaching — about not giving at-bats away, being a stubborn hitter,” said Stairs. “…I’m a firm believer in passing the baton and taking the walk. Let the guy behind you pick you up.” The Padres ranked 25th in MLB with a 7.7 percent walk rate last year and somewhat incredibly finished the season with a sub-.300 OBP as a collective unit, ranking last in the Majors at .299. MLB.com’s Chris Haft writes that young Giants relievers Kyle Crick, Reyes Moronta and Garrett Williams are all likely to get the chance to cement themselves in the 2018 season. Krick, 25 next month, may have the best chance to do so early in the year after already experiencing some success in the second half of the 2017 season, though his 7.8 K/9 and 4.7 BB/9 will need to trend more closely toward his respective Triple-A marks of 12.0 and 4.0. Williams has yet to even pitch in Double-A, but the 23-year-old lefty tore through two Class-A levels last season, and left-handed bullpen help is a need in San Francisco. Of course, the Giants still seem likely to add to the bullpen in some capacity this winter, though with myriad holes to fill throughout the roster, the presence of some internal options will be key.